UK Release Date - 4th January 1994. Live Tracks 05/06/07 - Recorded 6th June 1993 in Sheffield, England (the first audio release from the show). Live Track 06 - Only released on German CD single. Front Cover Live Photo - Taken on 10th May 1993 in Zurich, Switzerland. Special Formats - CD Single in Limited Edition Video Box sleeve with 12-page UK Discography booklet. Special Formats - German CD Single featuring Foolin'/TLFL Live from Sheffield. The third single from 'Retro-Active' was released in January 1994. 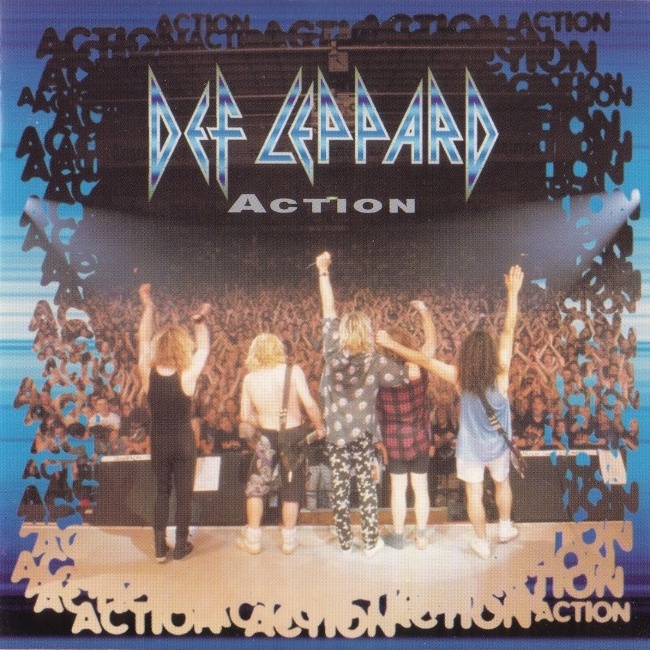 'Action' a cover of the Sweet classic was released in the UK and parts of Europe. It became another big UK hit reaching number 14 on the UK Top 40 charts. This single saw the first release of live audio from the Don Valley show. 'Love Bites' was included on the UK CD2 single. Both 'Too Late For Love' and 'Foolin'' were included on the German CD. 'TLFL' was only ever released on this single making it very collectable. The other two songs were later released with the Limited Edition of Vault. The second UK single was notable for being housed in a Video Style box - like an old VHS one but square. It included a 12 page booklet featuring a full UK discography of 7", 12", CD singles and albums up to 'Action' plus rare promo pics. This single would be the last one to have an official UK release on vinyl. Only a seven inch was issued but no 12". "Tracks 2 & 3 Recorded as nature intended, warts and all. Live with no overdubs at Don Valley Stadium, Sheffield, on June 6 1993. Produced by Def Leppard. Recorded by Dave Dade & Jeff Griffin on the BBC mobile. Remixed by Pete Woodroffe at Townhouse Studios, London." The photo was taken at the end of the 10th May 1993 show in Zurich, Switzerland as the band members took their final bows. The distinctive white clock is shown hanging from the roof of the Hallenstadion venue.